A 12-year-old whose ambition to become a dancer has been supported by the Ann Maguire Educational Fund is another step closer to his dream. Seven thousand schoolchildren are busy rehearsing on stage at the Sheffield Motorpoint Arena ahead of tonight's Young Voices concert- the first of five this week. Pupils from across Yorkshire, North Derbyshire and North Nottingham are being joined on stage by X Factor contestant Lucy Spraggan. There will be 7,000 different children on stage every night, and for the rest of the tour in London and Manchester, which is what makes it the world's biggest choir. The largest Children's choir in the world, Young Voices will be performing for the next five nights at Sheffield's Motorpoint Arena and leading them will be local X Factor star Lucy Spraggan. Lucy will be joining approximately 7,000 singing school children every evening this week as part of the Young Voices national tour. 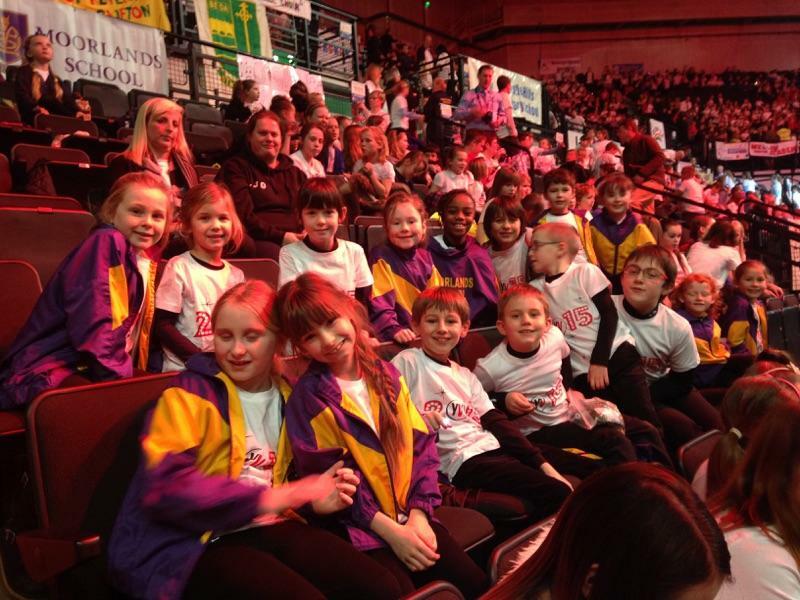 Young Voices provides an unrivalled musical opportunity for primary school children to perform all styles of music including folk, pop, rock and classical. Teachers & pupils practice the dance routines and learn the songs in their music lessons for many months before they come together for the penultimate show at their local arena. Lucy Spraggan shot to fame on X Factor 2012, she auditioned performing her own composition, 'Last night' but had to pull out of the competition due to illness, so she subsequently finished in ninth place, and second in her category. She was the first contestant in the show's history to score a Top 40 single and album before the live shows even aired with her independently released album Top Room At The Zoo. Lucy has been in the studio recording her new album preceded by the single 'We Are Unsinkable' due for release early next year and will be performing tracks from the album whilst on tour with the Young Voices choir. Conference North side Gainsborough Trinity has confirmed they are in talks to sign former X Factor contestant and I'm A Celebrity star Jake Quickenden. The 26-year-old was a youth team player with his home club of Scunthorpe United. Heartthrob Jake Quickenden has been voted off The X Factor, leaving his mentor Mel B in tears as she said goodbye to her first boy. Not all the judges were impressed though. Louis Walsh acknowledged that he is one of the most talented young people in the competition but said he did not like the song choice and got bored in the middle. Cheryl Fernandez-Versini said he needed to work on his performance and make better use of the stage and Simon Cowell said while he might make a very good recording artist he felt he looked uncomfortable performing that song. Bookmakers on Sunday morning had Jack as the second favourite contestant to be eliminated next with William Hill and BetFred both offering odds of 4/1. Following his performance Louis Walsh said it sounded as though he had been struggling with the high notes and he should spend more time with the vocal coach than in the gym. Cheryl Fernandez-Versini wanted to see more sensuality from him. Simon Cowell commented that there was no dynamic to the vocal and said it is unlikely he will survive another week. Bookmakers on Sunday morning placed Jake the favourite to leave the competition next with William Hill and BetFred both offering odds of 6/5. Scunthorpe's Jake Quickenden and Castleford's Jack Walton made it through to Week Three of the X Factor. The two X Factor contestants from our region have made it through the second week of the competition and will perform again on the talent show next week. Jake Quickenden's performed a version of Bonnie Tyler's 'Total Eclipse of the Heart'. Judge Louis Walsh gave his rendition the thumbs up, but judge Simon Cowell said there were some parts of the the vocal that were "terrible". Cheryl Fernandez-Versini also said she did not like the choice of song, though the Scunthorpe singer's song did get the thumbs up from his own mentor Mel B and Louis Walsh. Jack Walton from Castleford opened the show with Paula Abdul's 'Straight Up' playing his guitar for much of the song. The 18 year old was praised by all the judges with Louis Walsh describing it as 'brilliant' and Simon Cowell describing him as one of his favourite contestants. He had earlier been seen meeting One Direction singer Louis Tomlinson from Doncaster who is supporting him. The two acts who left the competition this week were Chloe Jasmine and Stephanie Nala. Jack and Jake will now join the remaining ten other acts singing in next week's show when the theme is movie week.